Dirtbusters are proud to offer residents of Warrington a professional pressure washing service. We can help restore and revitalise your driveway, patio, wood decking, block paving, sandstone and indian stone exterior floors. We do not use any chemicals, just high pressurised water. This is due to the fact that we have invested in a super powerful petrol-driven jet wash unit. The Dirtbusters jetwashing division has a great reputation when it comes to pressure washing in Warrington. From Bewsey to Padgate, Grappenhall to Penketh – you can spot a Dirt Busted clean drive and patio a mile off! If you have elderly relatives with slippery paths, or you are looking to sell your home, this is a must-have service. 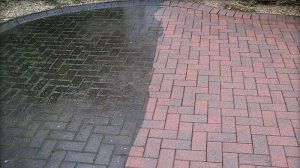 Here at Dirtbusters we only usually need to use incredibly highly pressurised water when it comes to pressure washing our customer’s driveways and patio area’s. If we are dealing with oil or maybe lichen, then the appropriate solution will be used with care and consideration. 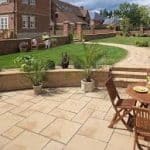 Our customers usually have patio area’s that consist of paving slabs, Indian stone, slate, paving circles, crazy paving etc. We can jetwash these types of exterior flooring with the minimum of fuss and have the area looking great in no time. 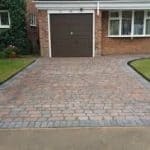 The most common medium of driveways we jetwash clean in Warrington is the block paved drive. These driveways take a lot of beating with the fumes from the family car, through to the slippery moss that builds up over the Winter months. Why not have your drive jet-washed whilst you’re in work? You will be amazed at the results upon your return! Once clean, we can re-sand the joints in-between the blocks. Your wooden garden decking looked fabulous when it was laid. But the ravishes of the Winters here in Warrington can leave the wood looking rather forlorn. 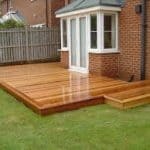 Here at Dirtbusters, we have the experience to clean your garden wooden decking correctly. What areas do we jet wash in? All of Warrington, as well as surrounding areas such as Widnes and St Helens. How do our clients pay for pressure washing services? You can pay with most forms of payment. BACS, cash or card are the usual choices. Are Dirtbusters insured for jet wash cleaning? Is a professional jet wash expensive? No! And it’s a no-brainer really as it can really transform the look of your home. Just call for a no obligation quotation. Maybe I will just use my Karcher pressure cleaner? Sure, if you have the time and patience. These machines don’t come anywhere near our petrol run beast. As well as offering a Jetwashing service, I can also help with carpet cleaning in Warrington as well as upholstery cleaning across Warrington too.